Among the options, you can see there&apos;s a command called ui. This is what we&apos;re going to explore. Import - will allow you to import a project from either a directory, or a remote github repository. Let&apos;s create a project. Click on the Create Tab, and click on the Create a new project here button. A pop will show up. Let&apos;s fill it in with the the project name scotch-vue. Press next, and you&apos;ll be taken to the presets tab. This is where we add in the configurations that are common to Vue applications. Select Manual and press next. You&apos;ll be navigated to the Features page so that you can select the Plugins and Configurations you want. I went mostly with the following configurations: Babel,Router, CSS Preprocessor, Linter/Formatter, Unit Testing, Use Config Files. Scroll down to see all the configs. Finally, press next and you will be directed to the configurations section. Here&apos;s where you customize the configurations for the features you added in the previous section. Tasks allow you to perform operations on your application, that you normally do when building apps. They include the following. I&apos;ve taken the descriptions directly from the UI. Inspect - inspect the resolved webpack config. Note - These tasks are listed here based on our configuration. We do not have the E2E task listed for instance. We&apos;ve seen that this section compiles and hot reloads your application. The first part of the Serve section allows you to configure the serve task. The analyzer tab, tries to analyze your code, and create a graph showing the various dependencies of your code. In the below screenshot, we see the purple part representing the code we have written(even though it&apos;s generated), and the green section represents the code that we imported from dependencies. Clicking on the config for build task will also open configuration to allow you specify environments, output directories and even choose whether it&apos;s a web app, library or web component. We won&apos;t look at the different tabs, as we explained them in the previous section, but notice that the analyzer, under your chunked app, has changed. 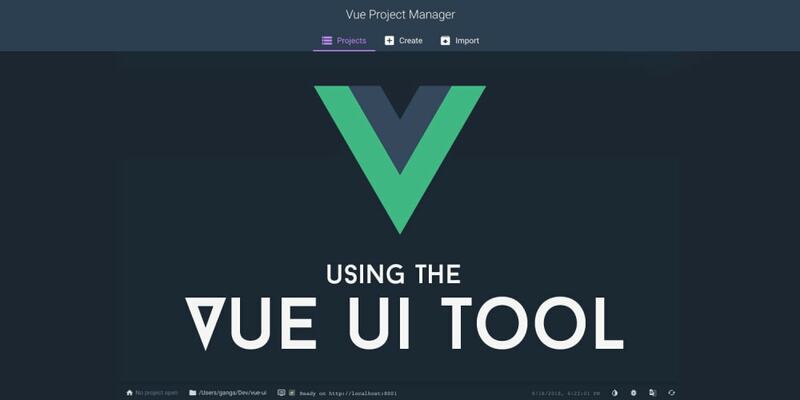 We&apos;ve seen how easy it is to scaffold a new VueJS application from scratch with the Vue UI tool. Even though still in beta, it can take you from Zero to building an App within seconds or minutes. Hope you find the tool helpful and use it more often, and watch out for new releases. And just in case you are wondering why the UI is so beautiful, the library used is the Vue UI library Happy Coding.